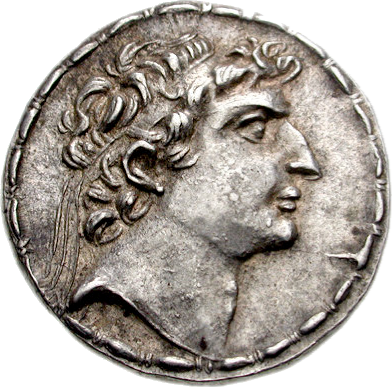 Seleucus IV was king of the Hellenistic Seleucid Empire from 187 BC to 175 BC. He was the second son and successor of Antiochus III the Great and Laodice III. Seleucus IV married his sister Laodice IV, by whom he had three children: two sons Antiochus, Demetrius I Soter and a daughter Laodice V.
He was compelled by financial necessities, created in part by the heavy war-indemnity exacted by Rome, to pursue an ambitious policy. In an effort to collect money to pay the Romans, he sent his minister Heliodorus to Jerusalem to seize the Jewish temple treasury. On his return from Jerusalem, Heliodorus assassinated Seleucus, and seized the throne for himself. The true heir Demetrius, son of Seleucus, was now being retained in Rome as a hostage, and the kingdom was seized by the younger brother of Seleucus, Antiochus IV Epiphanes.